From haul outs to full re-fits, we've got your boat maintenance needs covered. Park Isle Marine is a full service marina offering all major services for your vessel: Haul Outs, Repairs, Refits, Maintenance, Moorage, and Dryland Storage. Park Isle Marine has the expertise, facilities, tools and equipment to take care of any projects you have in mind. We have indoor facilities for vessels to 80' enabling us to get the job completed no matter what the weather or time of year. Our expertise spans all disaplines of boat building, restoration, refit & repair. 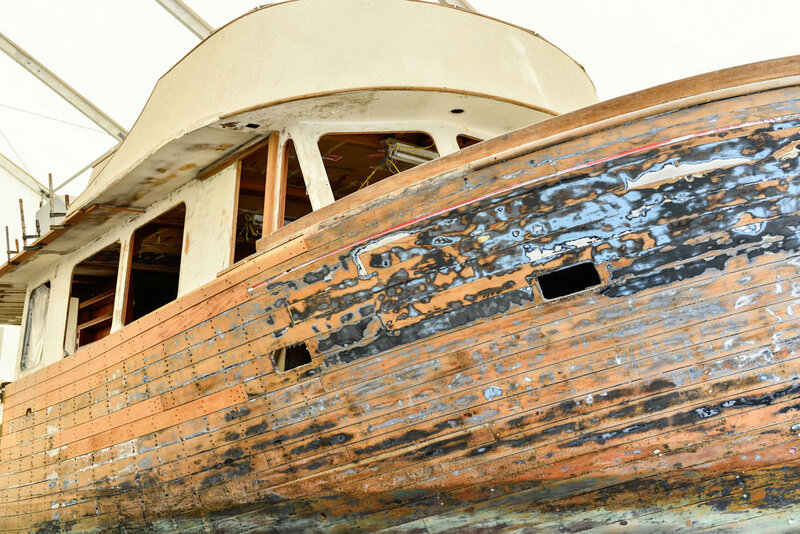 From replanking a classic wooden vessel to vacuum infusing a damaged composite panel. We offer re-painting of aluminum, steel or fiberglass vessels to yacht or commercial standards. Whether you're re-powering and re-wiring your vessel, or simply replaceing incandecent or halogen lighting with power efficient LED, we have the skilled trades people, the experiance and sources to get the job completed on time and on budget. We can haul out & service vessels to 72' length, 30' beam and 8' draft. Our new haul out machine can haul out full displacement, semi-displacement, planing hulls, catamrans and trimarans. We are the first haulout facility for incoming vessels entering Jaun de Fuca straight and the closest haulout facility to Victoria harbour. We have the expertise, facilities, tools and equipment to take care of any projects you have in mind. We have indoor facilities for vessels to 80' enabling us to get the job completed no matter what the weather or time of year. Our expertise spans all disaplines of boat building, restoration, refit & repair. From replanking a classic wooden vessel to vacuum infusing a damaged composite panel. Repainting an aluminum, steel or fiberglass vessel to yacht or commercial standards. Wheather you're Repowering and rewiring your vessel or simply replaceing incondecent or halogen lighting with power efficent LED. We have the skilled trades people, the experiance and sources to get the job completed on time & on budget. Proven to be cost effective, drylands storage reduces maintenance and therefore saves valuble time and resources while providing peace of mind during those winter storms. We have a live on site security gaurd with video surveylance and a locked security gate (locked during non business hours). Whatever project you have in mind, we can handle it from start to finish. Be it custom joinery (wood work), mechanical, electrical or hydraulic systems, fiberglass construction, modifications or repairs or paint and bright work. We can assist you with any portion of the project or take care of it from start to completion.